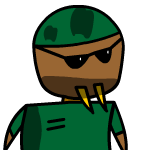 GeneralWalrus(me) has added a new emoticon. The name is Gentlemen. Useless widgets were added for your enjoyment. » I'm fixing this place. » I'm keeping this forum here. » Halo Reach or Black Ops?